^ Zeng, S.; Yong, Ken-Tye; Roy, Indrajit; Dinh, Xuan-Quyen; Yu, Xia; Luan, Feng (2011). “A review on functionalized gold nanoparticles for biosensing applications”. Plasmonics 6 (3): 491–506. doi:10.1007/s11468-011-9228-1. ^ González-Díaz, Juan B.; García-Martín, Antonio; García-Martín, José M.; Cebollada, Alfonso; Armelles, Gaspar; Sepúlveda, Borja; Alaverdyan, Yury; Käll, Mikael (2008). “Plasmonic Au/Co/Au nanosandwiches with Enhanced Magneto-Optical Activity”. Small 4 (2): 202–5. doi:10.1002/smll.200700594. PMID 18196506. ^ Du, Guan Xiang; Mori, Tetsuji; Suzuki, Michiaki; Saito, Shin; Fukuda, Hiroaki; Takahashi, Migaku (2010). “Evidence of localized surface plasmon enhanced magneto-optical effect in nanodisk array”. Appl. Phys. Lett. 96 (8): 081915. Bibcode 2010ApPhL..96h1915D. doi:10.1063/1.3334726. ^ Zeng, Shuwen; Yu, Xia; Law, Wing-Cheung; Zhang, Yating; Hu, Rui; Dinh, Xuan-Quyen; Ho, Ho-Pui; Yong, Ken-Tye (2012). “Size dependence of Au NP-enhanced surface plasmon resonance based on differential phase measurement”. Sensors and Actuators B: Chemical 176: 1128. doi:10.1016/j.snb.2012.09.073. ^ Minh Hiep, Ha; Endo, Tatsuro; Kerman, Kagan; Chikae, Miyuki; Kim, Do-Kyun; Yamamura, Shohei; Takamura, Yuzuru; Tamiya, Eiichi (2007). “A localized surface plasmon resonance based immunosensor for the detection of casein in milk” (free download pdf). Sci. Technol. Adv. Mater. 8 (4): 331. Bibcode 2007STAdM...8..331M. doi:10.1016/j.stam.2006.12.010. ^ Pillai, S.; Catchpole, K. R.; Trupke, T.; Green, M. A. (2007). “Surface plasmon enhanced silicon solar cells”. J. Appl. Phys. 101 (9): 093105. Bibcode 2007JAP...101i3105P. doi:10.1063/1.2734885. ^ Locharoenrat, Kitsakorn; Sano, Haruyuki; Mizutani, Goro (2007). “Phenomenological studies of optical properties of Cu nanowires” (free download pdf). Sci. Technol. Adv. Mater. 8 (4): 277. Bibcode 2007STAdM...8..277L. doi:10.1016/j.stam.2007.02.001. ^ Liedberg, Bo; Nylander, Claes; Lunström, Ingemar (1983). 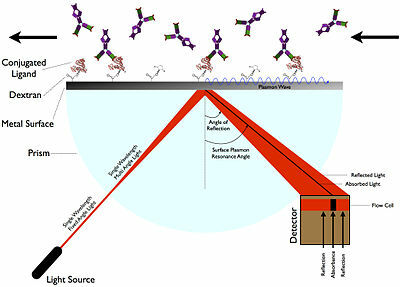 “Surface plasmon resonance for gas detection and biosensing”. Sensors and Actuators 4: 299. doi:10.1016/0250-6874(83)85036-7. ^ Rich, RL; Myszka, DG (2007). “Higher-throughput, label-free, real-time molecular interaction analysis”. Analytical biochemistry 361 (1): 1–6. doi:10.1016/j.ab.2006.10.040. PMID 17145039. Heinz Raether (1988). Surface plasmons on smooth and rough surfaces and on gratings. Springer Verlag, Berlin. ISBN 978-3-540-17363-2. Stefan Maier (2007). Plasmonics: Fundamentals and Applications. Springer. ISBN 978-0-387-33150-8. Richard B M Schasfoort (Editor) and Anna J Tudos (Editor) (2008). Handbook of Surface Plasmon Resonance. RSC publishing. ISBN 978-0-85404-267-8. 笠井献一. "表面プラズモン共鳴 (SPR) を利用したバイオセンサ." 蛋白質核酸酵素 37.15 (1992): p2977-2984. 孫暁春, 田島晴雄, 米田勝實. "変調レーザーを用いた差動型表面プラズモン共鳴バイオセンサ." レーザー研究 21.6 (1993): 661-665. 岡本隆之, 山口一郎. "レーザー解説 表面プラズモン共鳴とそのレーザー顕微鏡への応用." レーザー研究 24.10 (1996): 1051-1058. 栗原一嘉, 鈴木孝治. "表面プラズモン共鳴センサーの光学測定原理." ぶんせき 328 (2002): 161-167. 小島洋一郎. "超音波と表面プラズモン共鳴による味溶液の計測." 電気学会論文誌 E (センサ・マイクロマシン部門誌) 124.4 (2004): 150-151. 永島圭介. "表面プラズモンの基礎と応用." プラズマ・核融合学会誌 84.1 (2008): 10-18.